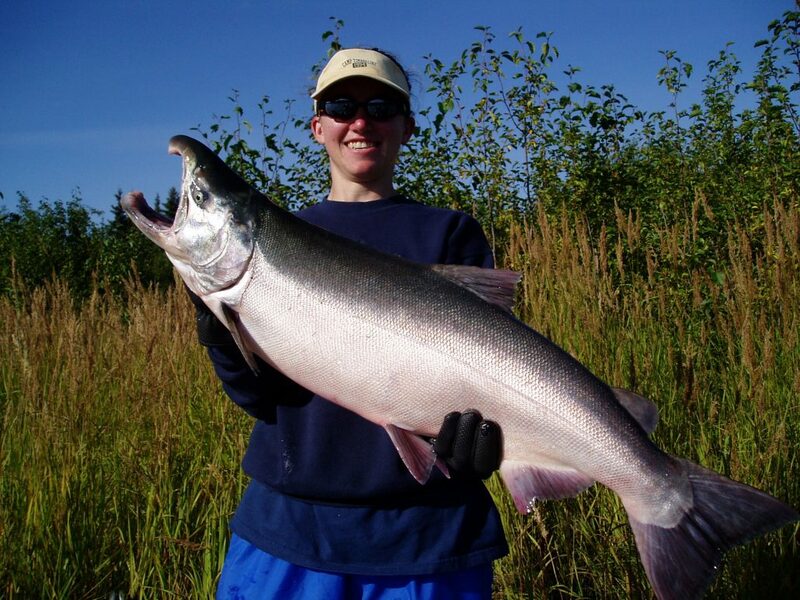 Silver Salmon or Coho Salmon are the most aggressive and acrobatic fish for their size. They can and will put up a fight you won’t soon forget!! These fighters will spend most of the fight out of the water. Silver Salmon are wonderful table fare. You will enjoy your bounty all year with these tasty fish. Silver trips are commonly combined with Trophy Rainbow trout trips at this time of year. All of our Trophy Rainbow charters are catch and release. The photos you take home will speak for themselves. Talk about a fun day on the water! The Kenai River offers two Silver Salmon runs. 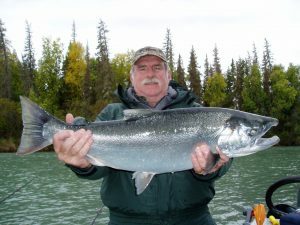 The first run is in August producing fish weighing in between 8 to 10 pounds. Occasionally you will catch a lunker weighing in significantly larger. The second run of these fiesty fish comes in September and October. The average size on the second run of silvers is historically larger than the first run. These beauties weigh in between 8 to 12 pounds, many fish exceeding the 15 pound mark. I have guided happy clients to 6 fish tipping the scales over 20 pounds. The State record on these acrobatic fighters is 26 pounds! Silvers can be caught using several methods. The most popular is casting various lures or trolling. Silver Salmon also love Salmon Roe and can be caught by backbouncing eggs or floating eggs using bobbers. Fishing for these mighty fish is generally from a powerboat. Bag Limit is two fish per day in August and three fish per day in September and October. 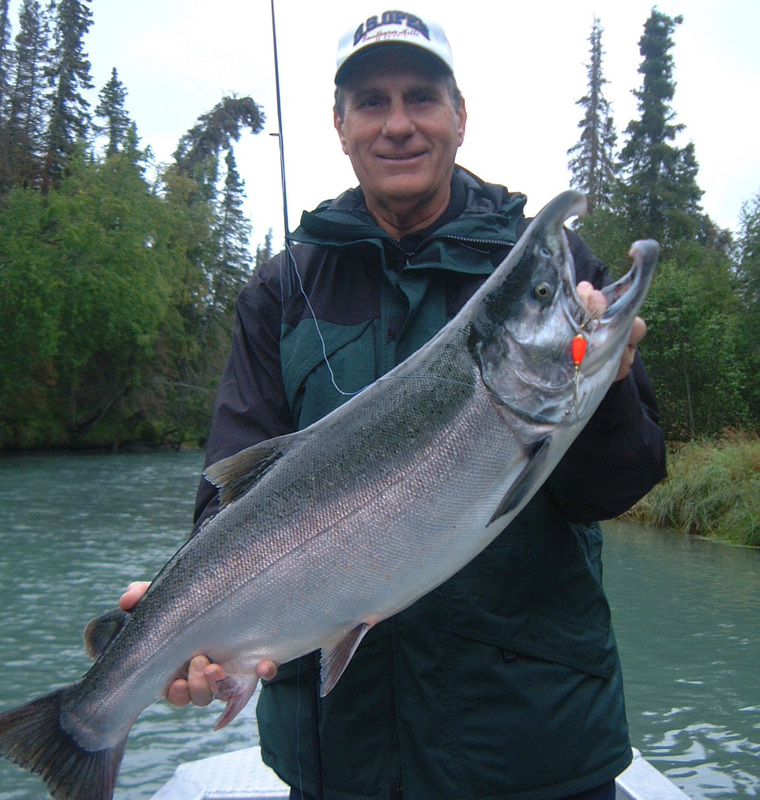 Contact Wet & Wild Alaska Fishing today to book your Silver Salmon Fishing trip of a lifetime!